Please refer to the Spreadsheet at the Bottom of the Page to Calculate Square Feet for Shutters. You can mount your window blinds or window shades inside the window frame/casing or outside mounted to the wall above the window. If you are mounting the blinds with an enclosed area such as between two cabinets, follow the inside mount instructions. In order to mount the window blinds or window shades inside a window casing, make sure you have enough depth to allow room for the window blinds. Specifications for window blinds or window shades are given on the minimum depths to mount them. Note: If your window frame depth is not deep enough for a “flush mount”, do not select a cornice style valance. If you need returns on your valance to cover the visible portion of the headrail, please call us and speak to one of our customer service agents prior to ordering. I) When mounting blinds inside the window casing or frame. Simply measure the width and height in three different places as shown in the inside mount picture. i.e. inside drywall to drywall or frame to frame. It is only necessary to give the smallest width and largest height to an 1/8 of an inch. If your width varies by more than 1/4 of an inch please call for special instructions on measuring. Enter exactly what your window frame measures. Take NO deductions. Ensure you have enough window depth. See individual products for details. 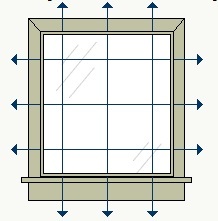 If you are measuring for shutters you NORMALLY will need a minimum of 2 inches of inside mount depth. If you have less than 2 inches than you may need a smaller louver size. The factory will take proper deductions to fit the size window you specify. II) When mounting blinds outside the window casing. 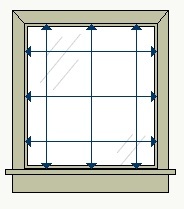 Simply measure the width and height of the window in three places. Remember it is only necessary to give the measurement to an 1/8 of an inch. Horizontal Blinds: Add 4 inches to the width and height measurement. Vertical Blinds Over a Slider: Add 6 inches to the width and 2 inches to the height measurement. You may also want to add to the width to compensate for vane stack when opened. The factory will take NO deductions on outside mount blinds or shades. You MUST add for overlaps. Vertical Blinds Over a Window: Add 6 inches to the width and 6 inches to the height, if you want to add more height to the blind it will always increase the overall cost of the product. To keep it simple here are some examples below.